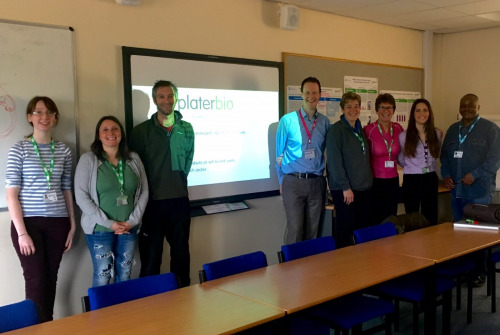 Agriculture and horticulture students at Moulton College, Northamptonshire gained a fascinating insight into biostimulants through a talk by Plater Bio’s technical Director, Dr Russell Sharp. Supporting the study of plant science, Moulton College has over 660 hectares of commercially farmed estates as well as a commercial garden centre, plant nursery and fully-equipped glasshouse and laboratory facilities. As the college is committed to providing its students practical resources as part of their courses, this seminar gave them a practical understanding of biostimulants and the science behind the products. Russell also gave them an understanding of the trends in the biostimulants market and the different uses of them commercially. The students had many different questions for Russell, both on his academic experience of plant science as well as his working knowledge of biostimulants in the agrochemical industry. For more information on biostimulants or to invite Dr Sharp to speak at your college or university, please contact us on +44 (0)1283 792600 or by emailing sales@platerbio.co.uk.